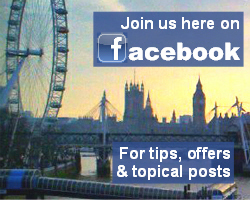 If you are visiting this site and you live or work within the UK, there is much that we can offer you. Scroll further down this page for a fuller list. 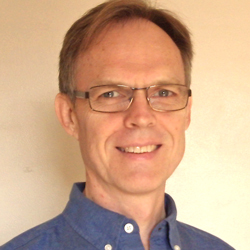 NVC Resolutions is the website of Daren De Witt, a qualified trainer with, and senior London representative of, the internationally recognised Centre for Nonviolent Communication. Daren has a lifelong fascination with what makes us tick as humans, and a passionate desire to help people relate to one another with more care and compassion. As well as offering Nonviolent Communication trainings for the public and organisations, Daren also offers conflict management training and mediation for organisations, anger management counselling, relationship counselling, voice dialogue coaching, and peer mediation for schools. Please explore this site to see how Daren can support you. 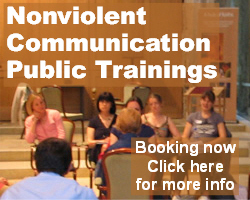 We offer Nonviolent Communication trainings for the general public. We run a regular programme of foundation and post-foundation trainings in London, as well as running occasional trainings in other UK cities and abroad. 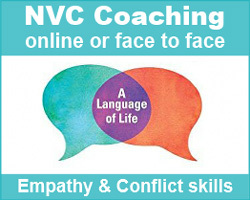 Visit our NVC Public Workshops page for more information. We offer individual coaching and counselling and support in various formats. Go to our NVC Coaching page to find out about conflict resolution and communication skills coaching for private individuals, as well as for staff in businesses or organisations. Daren also specialises in Anger Management Coaching, so contact him if you have difficulty controlling your anger. 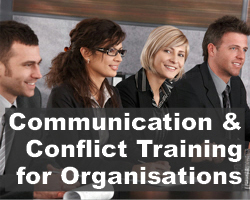 For organisations and businesses we offer cutting edge communication skills and conflict resolution skills training using the Nonviolent Communication (NVC) process, which is internationally recognised and recommended by leading international organisational coaches. Visit our Workplace Training page for more information. As well as Nonviolent Communication skills, Daren has specialist training in Couple Counselling and Relationship Psychotherapy. He offers counselling sessions for couples from his practice near Liverpool St station in east central London. Visit our Relationship Counselling page to find out more. 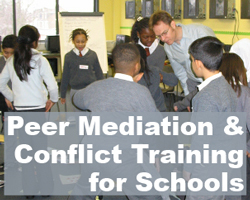 Daren offers Peer Mediation training for primary and secondary school students. Visit our Peer Mediation page for more information. Daren also delivers other trainings for schools, including communication skills and conflict resolution skills for staff and students, which you can read about on the same page. We offer mediation support for individuals experiencing conflicts in their personal lives, as well as for organisations and businesses. Mediation is growing in popularity in the UK as a quicker, more economical and more harmonious way to resolve disputes than traditional methods of dispute resolution. Visit our Mediation page for more information. We have assembled a range of Nonviolent Communication resources on this website. For an overview of the Nonviolent Communication process, visit our About Nonviolent Communication page . We have a list of links to free audio and video clips of Marshall Rosenberg talking about Nonviolent Communication which you can view on our NVC Online Resources page . On this page we have also assembled a list of links to the more important NVC sites worldwide, as well as a range of other NVC internet resources. Daren is based in East London. His public workshops take place mainly in London, currrently mainly in Hackney, midway between Hackney central and Victoria Park village on the southern border of Hackney in East London. Daren sees clients individually at two locations. One venue is located one minutes walk from Liverpool St station in the City of London. The other venue is located six minutes walk from Liverpool St station, in the heart of Shoreditch, Tower Hamlets. These locations are easily accessible from many parts of London, including Central London, The City of London, Shoreditch, Bethnal Green, Hackney, Islington, Camden, Kensington and Chelsea, Lambeth, Southwark, Tower Hamlets. It may also be possible to arrange individual appointments in Hackney, London. For organisational training, Daren is open to travelling to you, wherever you are based, in London or in the counties surrounding London – Hertfordshire, Essex, Kent, Surrey, Sussex, Middlesex, Berkshire and Buckinghamshire. Also, elsewhere in the UK, eg Brimingham, Manchester, Leeds, Liverpool, Sheffield, Edinburgh, Bristol, Leicester, Coventry, Bournemouth. Daren also offers counselling & coaching support via Skype. Contact Daren to discuss the support he can offer you. "Daren, you have a very helpful balance of calm and wisdom, which helps create an effective and safe and constructive learning environment. I appreciate it! - Benjamin W.
"You are clearly skilled in connecting with the needs and feelings of others - finding ways to enable that connection. This includes us overcoming our apprehension and uncertainties in training. It was a pleasure working with an empathic listener whose knowledge and patience I have found so valuable. I hope to have the opportunity to learn with you again." - Lindsey I. “I want to express my gratitude again for a very special weekend . . . as powerful and as rich in ancient truth and wisdom as the principles of NVC are (and I believe Marshall Rosenberg to be one of the great teachers of the last century along with the likes of Gandhi, Luther King and Mandela), what we received was as much the part that you played in teaching us. I was profoundly touched by your willingness to share your own struggles and successes with us. Also, your presentation and facilitation skills were clear, connecting and seamless. I also get how important this work is to you personally and that was impacting too.” – Janet K.
“Daren, I want to let you know how you have taught me so well, impacted me, helped me and continue to help me by your example. Our sessions were healing, transformative, creative, unique and very special….and I will never forget them!” – Sue B. “I gained a true sense of being respected and understood from my time with Daren. This was in sweet contrast to help I have experienced elsewhere which has sometimes left me confused by interjections of judgement and analysis – stopping me in my flow and breaking rapport. With Daren I felt supported to deepen naturally and to develop my truth without ever consciously being therapised. This took me further, faster than I had imagined and I shall carry the acceptance I experienced with me going forward.” – Andy N.